Cycle Seen is a celebration of the cultural diversity found within one city’s cycling community. 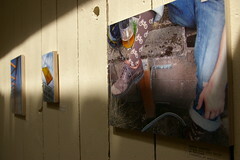 The event features bicycle related photographs collected from local artisans and cyclists. Photos are grouped together and displayed in 9 locations throughout the city of Portland. The locations are as diverse as the photos; they range from cafes and bike shops, to a local grocery store. This makes each gallery and its surrounding community of artists unique. A 30 mile organized ride is scheduled to hit all 9 stops on June 14th. The above pieces can be found at Stumptown Coffee Roasters and will be auctioned off, with proceeds benefiting the nonprofit “Bikes to Rwanda.” The show will run in most locations through the end of June. Previous Previous post: Smack! Pow! Zing! Ooof!